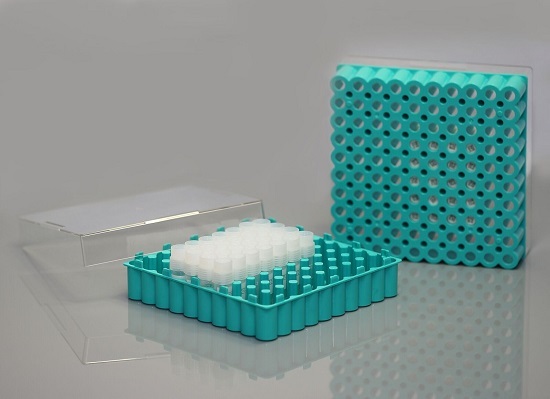 Whether you are looking for microcentrifuge tube racks or tube holders, PCR tube racks, conical tube holders or microtube storage boxes, Pipette.com will help you find the right storage accessory for your tubes. 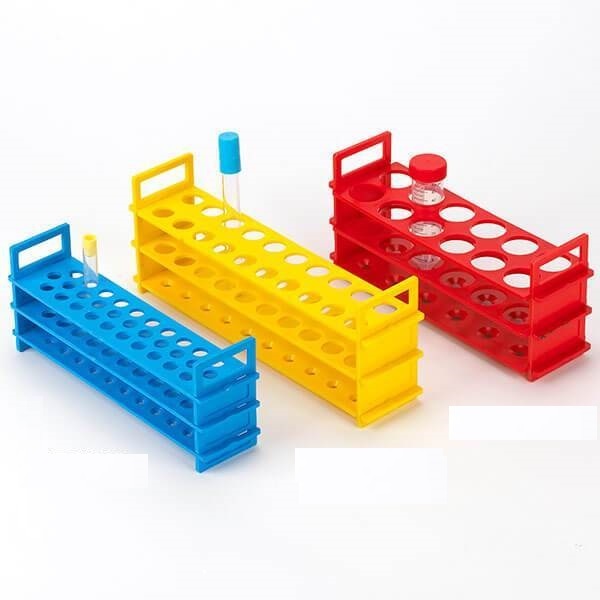 Pipette.com carries tube racks and tube holders from a broad selection of manufacturers including Heathrow Scientific, Simport, Wheaton, MCT Bio, BrandTech, Capp, Eppendorf, Excel Scientific, Scientific Specialities,CellTreat and our very own Pipette.com Tube Racks and Tube Holders. Our tube racks and tube holders selection will ensure you are able to store the widest range of tubes, from 0.2 mL to 50 mL, depending on your needs and the type and size of tubes you use. We offer PCR workstations, floating racks, and storage units to help organize your freezers and that are capable of holding up to 100 microtubes and cryogenic vials at a time. These units can hold tubes made from almost any type of material. They are also available in a huge variety of colors so that you can easily assign colors to different tasks or work stations, and easily identify what different racks are used for. They are also made from various different material. 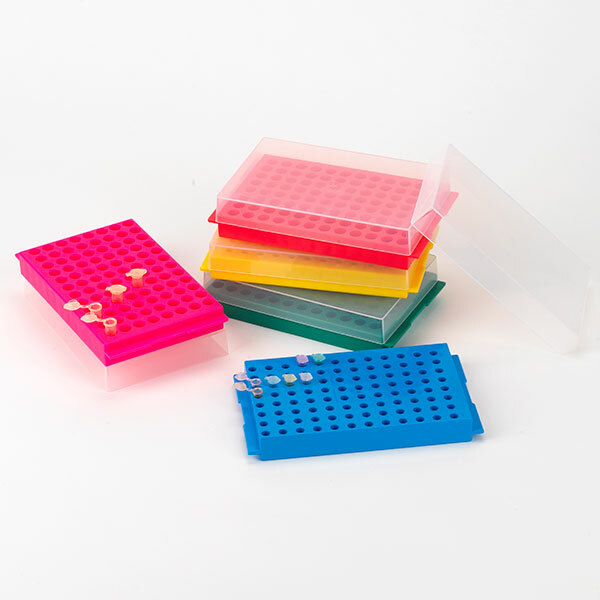 Our freezer storage boxes are also available in a selection of different colors for quick sample identification in the freezer. 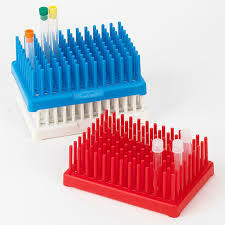 The huge variety of tube racks and tube holders available here at Pipette.com means that we have the right rack or holder to meet whatever specific requirements you have. Scroll through the various tube racks and tube holders below to find the unit that best meets your needs. If you need any assistance in choosing the right piece of equipment to hold your tubes, just give our team a call on 1-800-243-3232 and a member of the Pipette.com team will be happy to talk you through the various options available and help you pick the perfect rack or holder for you. 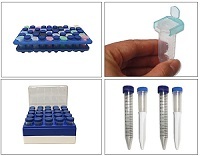 Pipette.com now offers variety of Tube Racks and Holders. 80-Well Microtube Rack easily fill and transfer 80 tubes in compact arrangement (5 x 16 array). Polypropylene rack holds 1.5 to 2.0 mL microtubes. 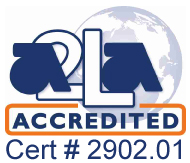 Molded-in coordinates aid organization. Autoclavable. Assorted colors: blue, green, pink, yellow, and orange. Measures 225 x 67 x 28 mm. 80-Well Microtube Rack come in a pack of 5. 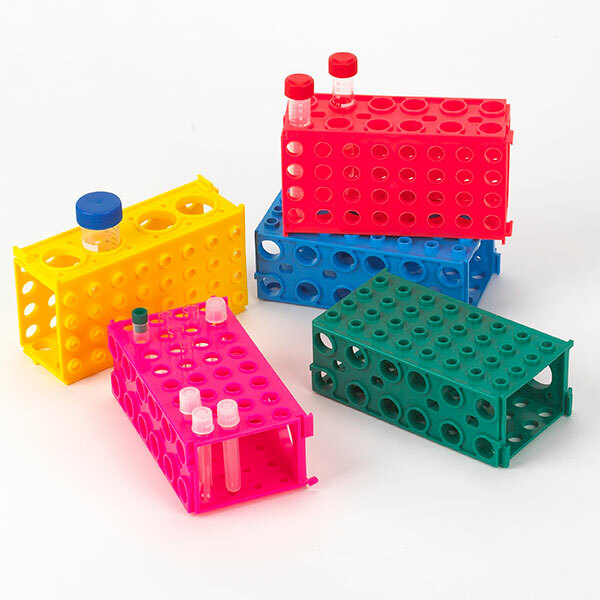 Cryogenic Vial Boxes are an easy and simply way to store small samples and tubes. Box footprint is 133 x 133 mm. Compact storage box has angled front slot for easy access to tubes. Rugged polypropylene box has durable three-point hinges, snapping clasp for secure closure, molded grid lines on lid, imprinted coordinates on bottom of base, and imprinted and raised coordinates on tube wells. 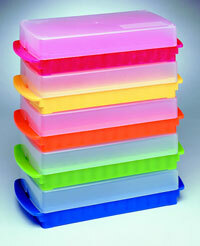 81-Well Microtube Storage Boxes store 1.5 to 2.0 mL microtubes under easy-open, friction-fit lid. Locate tubes is easily with molded grid lines and a molded reference point on the lid. Polypropylene box fits in standard freezer ­racks. Autoclavable. Assorted colors: blue, green, pink, yellow, and orange. Box measures 130 x 130 x 47 mm. 81-Well Microtube Storage Boxes come in a pack of 5. Wire Racks for 16mm Tubes are chemical-resistant, epoxy-coated steel racks feature a slotted bottom and reinforced edges. Tubes sit securely in the square holes and the middle rung provides added support. Use smaller 72-well rack where space is at a premium. Wire Racks for 16mm Tubes are autoclavable. 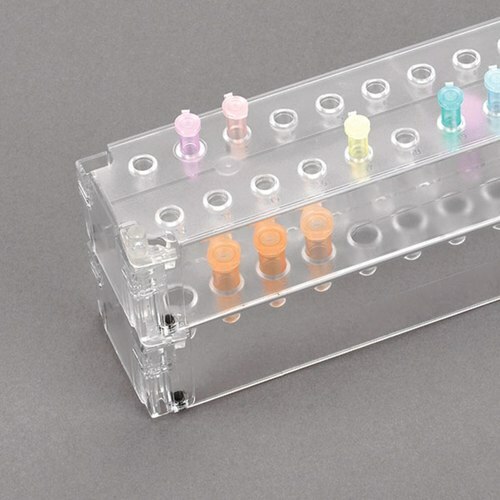 These racks help you keep large numbers of microtubes organized on your benchtop. Holds up to eight 80-well microtube racks filled with either 1.5 or 2.0 mL microtubes. Plenty of room to slide the racks in and out. Vertical rack measures 236 x 157 x 234 mm; horizontal rack measures 310 x 236 x 122 mm. OneRack Half-Size and Full-Size Test Tube Racks are durable and molded in a single, continuous piece—no assembly required and no detachable pieces. Racks are made of polypropylene or Delrin® fiberglass-reinforced polyoxymethylene (POM), an engineered polymer developed by DuPont to have exceptional chemical and heat resistance. These durable racks are molded in a single, continuous piece—no assembly required and no detachable pieces. Racks are made of Delrin® fiberglass-reinforced polyoxymethylene (POM), an engineered polymer developed by DuPont to have exceptional chemical and heat resistance. 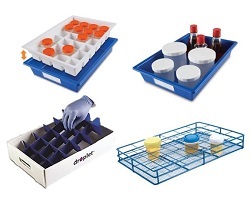 Lightweight and sturdy sample storage trays with removable inserts. 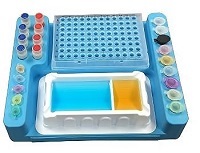 Trays are stackable and can hold up to 24 specimen containers. Designed to hold both 15 mL and 50 mL centrifuge tubes in one rack. The rack ships flat and is simple to assemble. It holds twenty 50 mL and thirty 15 mL centrifuge tubes. Can be easily and economically stored due to flat shipping. These specially shaped "Z" racks are manufactured from rust proof stainless steel and will therefore hold up to repeated use without blemish. The wide base provides stability and prevents tipping. When not in use, these Globe Scientific Stainless Steel Tube Racks stack neatly inside one another to conserve benchtop space. Globe Scientific Wireless Tube Racks are ideal for your laboratory setting and applications. Globe Scientific TUFFBLOK Tube Racks can be linked together using multiple racks to form a custom rack solution for your tube storage needs. Globe Scientific polypropylene tube stands are one of the best options to manage your samples, reagents and buffers on the bench. These tube stands are made from high quality polypropylene and are autoclavable. Globe Scientific polypropylene tube reversible racks come in a variety of colors. 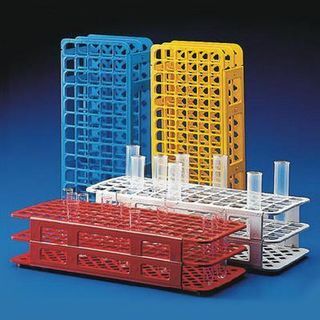 Globe Scientific polypropylene peg tube racks are high quality and will meet your tube storage and tube drying needs. Globe Scientific polycarbonate microcentrifuge tube stands are an idelal option to manage your samples, reagents and buffers on the bench. NEST Tube Racks and Tube Boxes are a reusable and economical solution for storing and freezing your tubes and microtubes. 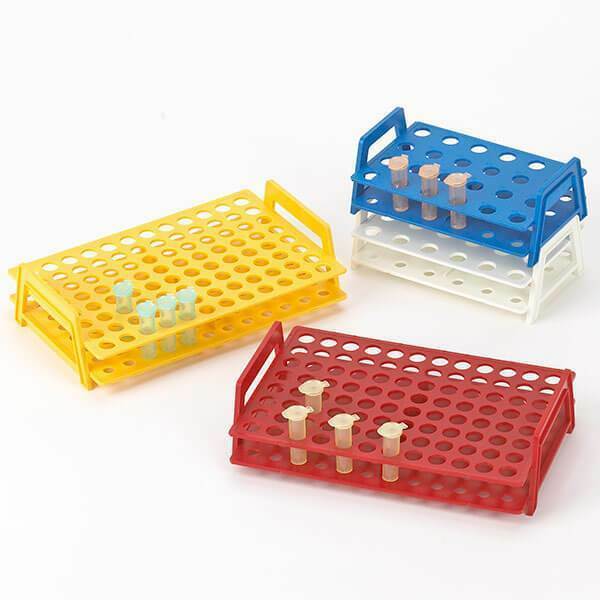 NEST Tube Racks and Tube Boxes are an essential piece of kit for any lab working with small volumes of solutions. 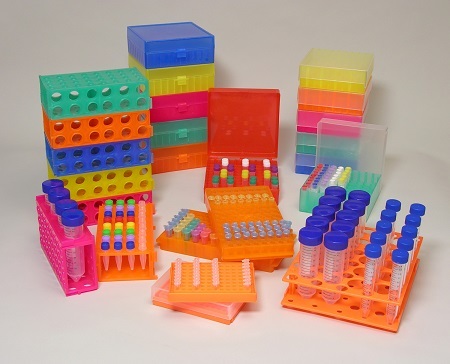 Globe Scientific polypropylene tube racks are one of the best options to manage your samples, reagents and buffers on the bench. Globe Scientific polypropylene floating tube racks are one of the best options to manage your samples, reagents and buffers on the bench.